For those of you that own a female dog you have probably dealt with a bout or two of puppy love directed at your spouse. Pippi is no exception, she is mad for Josh. She has recently started to fall victim to a terrible habit, getting lovesick while he is away. Josh spent about a week and a half out on tour without us, helping out another team. During this period Pippi actually made herself sick. After three days of mopping around she did perk up a bit and was tolerable. This morning Josh left for a two week trip, out to help another tour. She was getting frantic last night while he packed and I know that I’m in store for another three days of “Whoa is Pippi”. And it’s not like I don’t miss him too! 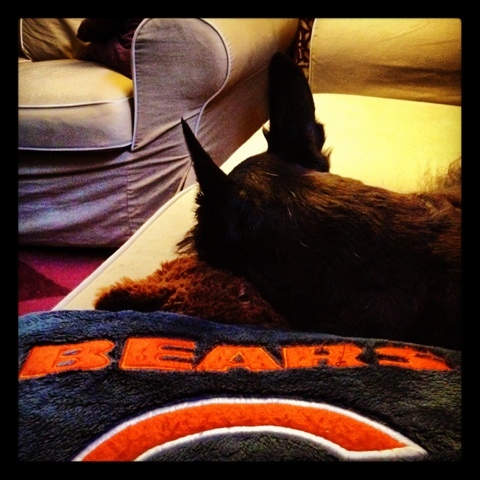 This entry was posted in Josh, Pippi and tagged puppy love, Scottie, Scottie dog, Scottish terrier. Bookmark the permalink. aww, poor baby! so is she generally a daddys girl, Elizabeth will do this when I’m away but shes a mamas girl all the way, could care less if her daddy is gone as long as im home. She does show him affection and gets excited to see him! Pippi is obviously overlooking the better choice here however. Mom all to herself, or dad. I would miss Josh, but having you all to myself would brighten up anybody’s (doggy’s) day. oh no! Pippen does a pretty good job of splitting her time, it’s almost funny! She is more playful with her daddy and more cuddly with me. She does fine without one of us, but she gets pouty when she is away from both of us! Pippi knows a good man when she sees one. Aww…Pippi!! I know how you feel cuz I am like that with Addy being gone. I still am not just myself yet. I only eat if she puts people food with my kibble otherwise I wont eat. I really miss my Dog-zilla!! That’ sweet, in a way. We know she’ll be very happy when dad comes home. oh, poor baby girl. We’re in Chile for a month without our dog boys. I’m totally suffering…so I understand what she’s going through…sort of. You poor girls! I hope you both make it until Josh comes back.